After noshing on marrow bones at several of NYC eateries, Prune and Blue Ribbon being a couple of favorites, I realized that, fancy pants as the dish may seem, its the sheer simplicity of it that makes it. Anyone could make it, really. The only barriers you might have are: A. finding the bones (I found mine on the shelves at Fairway, but I am sure your butcher has them lying around), B. trimming the exterior of the bones, which will require a very sharp paring knife to scrape away at the external flesh. I have heard that some people soak the bones in order to remove blood, but I did not do this. It was fine. 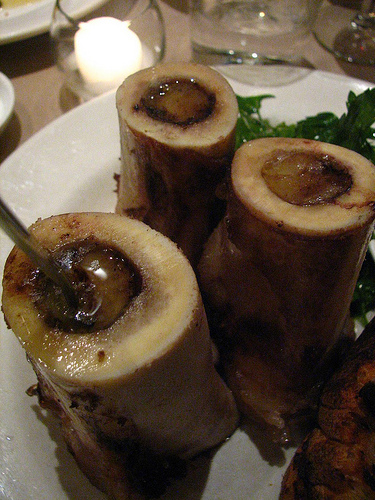 After you have achieved the basic recipe, you might want to compliment the marrow with a marmalade. Blue Ribbon serves them with an oxtail marmalade that is delicious. Onion marmalade works, too. A crisp fennel and parsley salad might help cut the richness of the dish for the faint of heart. If you have access to a grill, grilled bread is phenomenal with marrow. Toss the bones with oil and rosemary sprigs. Cover overnight. Preheat oven to 400. Place bones on heavy baking sheet right-side up and bake until the center is gelatinous, but not runny. Meanwhile, make toast like the French. For those of you who didn’t waste $40K on culinary school to find out how, save your money. I’ll tell you: Melt butter in a skillet on a medium high flame. (Do not let it achieve any color.) Place two pieces of bread in at a time and move around frequently. Flip, add more butter as needed. When perfectly golden on both sides, place on paper towel and salt. It is vital to your experience that your toast be soft, not a cracker. Remove bones from oven and carefully remove with spatula onto a plater. (Do not let any of the marrow escape.) Serve with buttery toast and Maldon salt. Garnish with fresh rosemary and lemon wedges. Roasted garlic optional.